Students with special needs will receive more help to support them beyond graduation through a guide and training scheme. From next year , all special education (Sped) schools will receive a guide titled Transition Planning For Living, Learning And Working - Making It Happen, to help students with setting post-school goals. "Careful planning and preparation is important for such students and their families," said the Ministry of Education (MOE) yesterday in a statement, acknowledging the challenges of transiting out of school, especially for Sped students. Sped schools will therefore work more closely with their students from the age of 13, as well as their families, and help link them up with relevant services after they graduate. For instance, students could have individual transition plans that would help them see which pathways best fit their interests. Mrs Lisa Goh, principal of Grace Orchard School, one of the five schools which has tested the guide since 2014, said it provides suggestions and templates on how schools and parents can prepare students for the transition process. Her school works with parents, teachers, training instructors, job coaches and therapists, as well as the students, to come up with individual plans for students based on their strengths and interests. Currently all its 18-year-olds - 14 of them - have drawn up such customised transition plans, and the school will be extending it to its younger cohorts, ranging from 15 to 17 years old, next year. Madam Wong Mah Li, 51, whose 18-year-old son Shawn has Down syndrome, said she appreciated how Grace Orchard School looked out for job stints for him that suited his outgoing personality. He is graduating from the school this month. During school, he tried out attachments at places such as an equestrian academy and a social enterprise bakery, Flour Power, and will be starting part-time work at the latter next January. "I meet up with his job coach, teachers and work supervisors now and then, to look at how he's doing and see if the job fits him," said Madam Wong, a real estate agent. Meanwhile, a programme to help Sped students find work has borne some fruit, said MOE, the Ministry of Social and Family Development, and disabilities support agency SG Enable yesterday. Of the 30 students who joined the school-to-work transition programme, which started in 2014, 24 found a job, with 20 staying employed for at least six months. The government agencies' statement said students who took part felt they had a sense of self-worth in being able to earn an income and contribute to their families. Parents said the programme helped their children acquire work skills, more self-confidence and independence, while employers reported that their staff developed more positive attitudes towards people with disabilities. The programme started in 2014 with students from five schools - Pathlight School, APSN Delta Senior School, Grace Orchard School, Metta School and Minds Woodlands Gardens School. It begins in the year of graduation and lasts for up to a year after that. SG Enable and schools identify students with the potential to work and match them with job training based on their interests. They also receive support from job coaches. 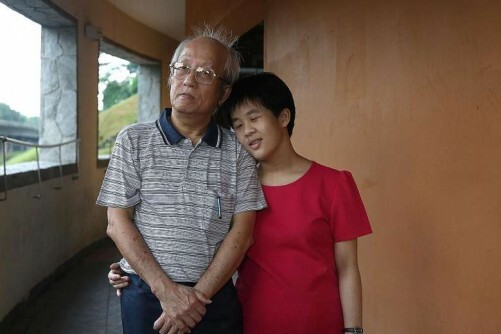 Retired engineer Chong Voon Teck, 64, is thankful that his daughter, Wan Shuen, 20, who has a mild intellectual disability, could find a job with help from the programme. After graduating from Minds Woodlands Gardens School, she had two months of training with SG Enable last year before starting an internship with the National University Hospital's linen department, where she learnt to fold and sort clothes. Since January, she has been hired as a health attendant in the same department. "She does it with a smile, and she travels on her own to work, so I think she enjoys it," said Mr Chong. "The programme made my burden lighter. I never thought she would be able to work. She's so lucky."